The Pentagon told the Russian military where U.S. Special Forces are located in Syria with the hopes that Russian aircraft will steer clear of that area and not risk bombing American service members, top military officials said Thursday. “This was a step we took to try to maintain their safety in a dangerous situation and this was a request that we made to the Russians outside the scope of the” memorandum of understanding, Cook said. “Up to this point, [the Russians] have honored this request,” Cook said. The official memorandum of understanding between the U.S. and Russia came in October after Russia began daily airstrikes in Syria. The agreement was limited in scope because the U.S. and Russia have sharply different military goals in Syria. 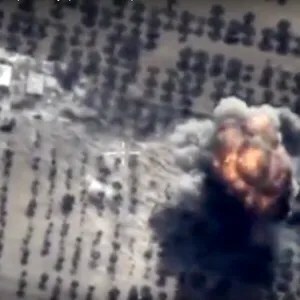 The U.S. is focused on defeating Islamic State militants while Russia is conducting airstrikes mainly in support of the embattled regime of Syrian President Bashar al-Assad. In December, the U.S. began sending teams of up to 50 special operations troops into northeastern Syria to support Syrian rebel groups fighting the Islamic State group, also known as ISIS or ISIL. About that same time, the U.S. told Russian military officials the general location of those troops, said Air Force Lt. Gen. Charles Brown Jr., head of U.S. Air Forces Central Command. Cook said high-level U.S. Defense Department officials shared the information with their counterparts in the Russian Ministry of Defense. He declined to say whether the U.S. and Russia had any formal written agreement. The U.S. has rejected some similar requests from Russia. “There have been requests made by the Russians that we have not been willing to agree to,” Cook said. The Air Force commander said the agreement is informal. “I don’t have any assurances, really, from the Russians. But we told them … these general areas where we have coalition forces. And we don’t want them to strike there because all it’s going to do is escalate things,” Brown told reporters in a briefing from his office in Qatar. The Defense Department has repeatedly cited operational security and declined to say publicly where the U.S. special operations troops are in Syria. Several local news reports say the U.S. forces have taken over an airfield in northeastern Syria, Rmeilan Air Base in the Syrian Kurdish region near Syria’s Iraqi and Turkish borders. In January American helicopters were at the base as local workers expanded the runway, according to the Syrian Observatory for Human Rights. The airfield was until recently under control of the Syrian Kurdish forces, known as the YPG, but was turned over to the U.S. to help expand American support for the Syrian Democratic Forces, which is the loose-knit coalition of American-backed militants fighting the Islamic State group. Be the first to comment on "U.S. quietly tells Russia where American troops are located inside Syria"